Eight years ago, I lost my little brother, J. T., to the prescription drug epidemic that is growing and has been killing our families and friends. J. T. was the most charming person you could ever meet: an amazing musician, compassionate to all, and the best man at my wedding. He became addicted to the powerful painkiller OxyContin. Before 2007, I had no idea what OxyContin was, but I’ve found that his story of becoming addicted was all too familiar to many others. According to the Centers for Disease Control and Prevention, more than 28,000 people died from prescription drugs alone in the United States in 2014—far more than car accidents. And many more addictions continue to impact families. I spoke very little about this topic during the first several years after J. T. passed, and I certainly didn’t think I’d ever be writing about it in relation to mapping. However, if our country, our families, and our friends are to truly address this issue, we must understand what it is and where it’s happening. I’ve become much more vocal in sharing this painful story, and maps have been my voice to raise awareness about the problem. Associated with this epidemic is a definite stigma that needs to be refuted. This is happening to people everywhere—rich and poor, north and south, and within every demographic—so I started a memorial story map, Celebrating Lost Loved Ones. It shows a very small sample of biographies written by people I’ve met who also lost loved ones to this epidemic, and the story map has been growing via social media. Each lost loved one has a picture and a bio with details about what made them special. Family members contribute by writing to CelebrateLostLovedOnes@gmail or contacting the community Facebook page. 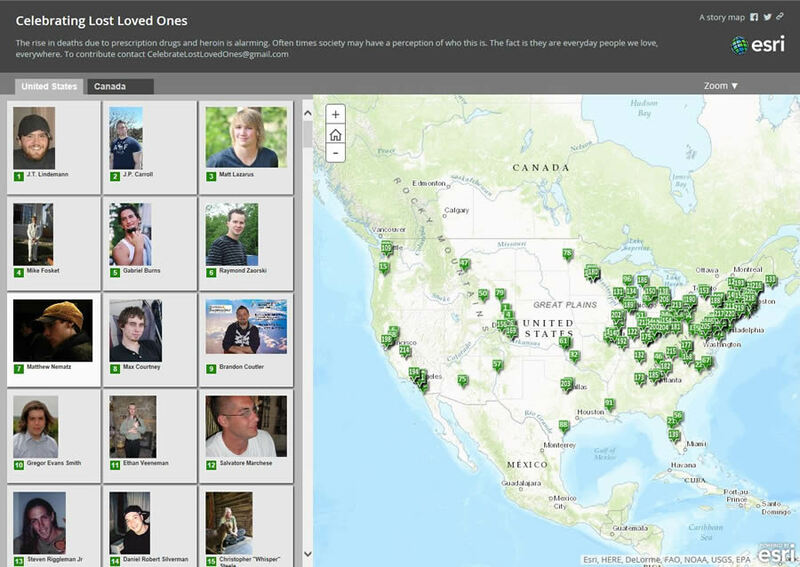 Grieving families in Canada have also started their own story map, and I have been collaborating with them to update the Celebrating Lost Loved Ones map. The map I created shows both prescription drug and heroin deaths. It is well documented that many people who start with opioid pills move on to heroin when it becomes harder to find pills, as the two drugs are very similar chemically. So the prescription-drug abuse epidemic and heroin addiction are bound together, causing massive impacts. The map above is meant to help break through the stigma and show that the problem is real, but it doesn’t tell the whole story. Individual states are putting together examples to show the impact within their communities, such as in the story map below, created by the Connecticut Office of Policy and Management, Division of Criminal Justice Policy and Planning, Research Unit. Create mortality maps like the one above. Mortality maps show trends within a community and where extra outreach may need to occur. These trends can be shown in a variety of ways, including dashboards of local coroner data. The Arizona Department of Health Services has a great dashboard and an accompanying video. 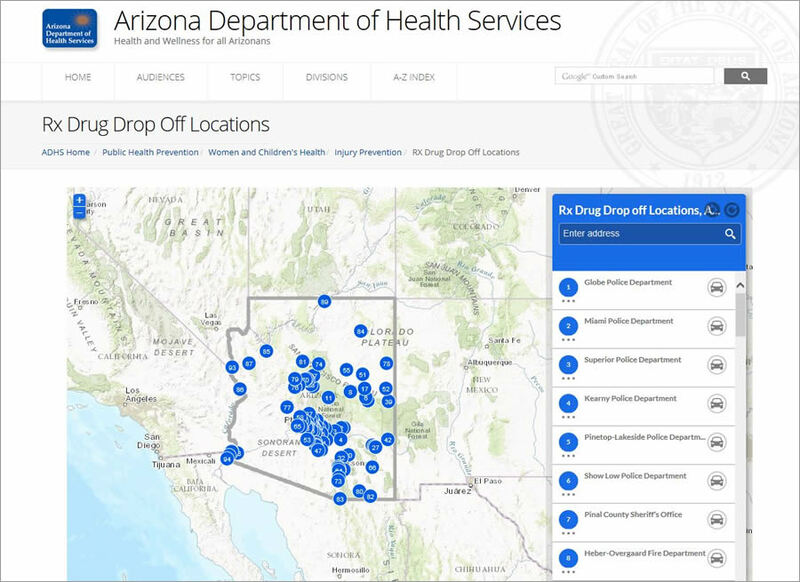 Make maps that show prescription drug drop box locations such as this example from the Arizona Department of Health Services. This is important, as it helps explain where to dispose of drugs so that they don’t get into drinking water or into the hands of other people. You can see states and counties that have similar drop box maps. 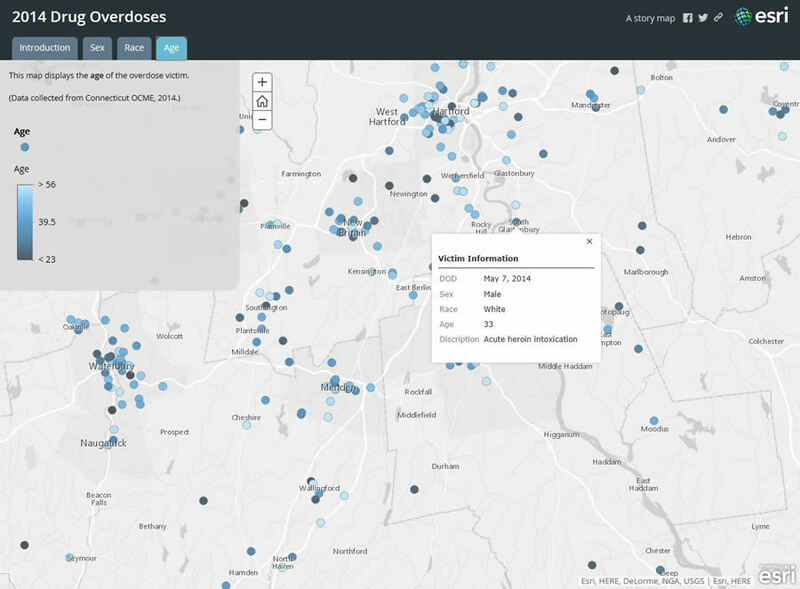 Create maps that show where to find help for addiction. When a loved one needs help, family members don’t always know where to turn. 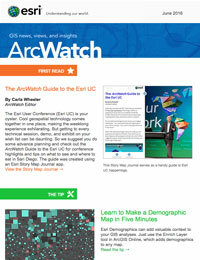 Local resources, such as Riverside University Health System sites, can be invaluable. Provide maps that show where to obtain the medication naloxone (Narcan is one brand name) and where it is administered. Naloxone can reverse the effects of an overdose. Police and fire departments administer it in emergencies, and maps, such as this one by the City of West Allis, Wisconsin, show how prevalent trends are and where overdoses have been prevented. Since naloxone is not readily available in all states, maps showing pharmacies that provide access to the medication can be lifesaving. These simple resource maps can be just the start. Visualizing trends can help you build a story and gain a deeper understanding about the prescription drug addiction issues in your community. This will lead to better decision making, whether it’s in deciding where to offer treatment for prescription drug addiction or where to educate youth about the problem. A great depiction of how statistics and geography come together is in this story map of Massachusetts. To see more examples of what federal, state, and local governments are doing, please see this gallery, which will be updated as new applications are shared.